I posted here earlier about “Fascism as killers of Republican Constitutions” just before the 2016 USA Presidential Election. It was a serious warning to the Middle Class around the world, and in particular the American people. No matter where we stand, the fact is that the strongest and most powerful nation today is the U.S.A. It has a Republican Constitution that has breed the wealthiest, most powerful and numerous Middle Class ever existed in recorded human history. Yes, American society has many problems, but still is the best politic-socio-economic to succeed. The preservation of the U.S.A. REPUBLIC and its constitution is a sine quanon condition for the survival and expansion of the Middle Class around the world. This is why the French monarchy, Napoleon, the Russian Tsars and many others, supported, helped and even protected the USA Republic during its early years and at its darkest moments. However, the success of the American Middle Class and elsewhere, is relatively speaking a new politic-socio-economic phenomenon that goes back to the Industrial Revolution i.e. late XVII. Before that time, the West and the rest of the world were basically ruled by tyrannies and monarchies for over 1,700 years. Yes there were few exceptions, like the Republic of Florence, and few other city-state republics that strived for few centuries but were all crushed by the Dark Age millenarian powers. The CHANGE OF POWER AND WEALTH TO THE NEW MIDDLE CLASS has never been forgotten, forgiven or given up by the ruling class during the obscurantism medieval. The U.S.A. Republic and its constitution survived in 2016. A “Middle-Class parvenu, political neophyte but outstanding businessman, gutsy and street smart” defeated and cracked the selected candidate of the glossy but perverted establishment. After I posted here those few articles, it has been confirmed my apprehension regarding the U.S.A. electoral process and result, namely, A POLITICAL FASCIST COUP WAS IN THE MAKING and continue today. It is beyond party lines and ideologies. For the “establishment of the obscurantism” IT IS ALL ABOUT GLOBAL POLITICAL POWER THROUGH GLOBAL FINANCIAL POWER aka independent central banking. However, as long as the Middle-Class progress and expand ECONOMICALLY with their business and industries at national e international levels, the “establishment of the obscurantism” can never succeed. Therefore by mid-1800s they created a most heinous, virulent, bloody, criminal and barbaric ideology to DESTROY AND KILL THE MIDDLE CLASS! In fact, Marxism in all its shades and colors caused the death of over 150 million people just in one century with their “proletariat revolution against the petit bourgeois aka Middle Class” The wealthy Karl Marx, married to Baronesses Jenny von Westphalia, sister of Ferdinand, the Interior Minister of the Prussian Empire stated: THE MIDDLE CLASS DOES NOT RULE THE WORLD BUT IS A MAJOR MENACE TO THE RULING CLASS AND THEREFORE IT MUST BE DESTROYED. The Industrial Revolution created by the Middle Class triggered a panic at the highest spheres of governments, Vatican and financial bankers. They realized, like Marx and many others that “the political power is a reflex of economic power and becomes precarious as soon as economic power passes to a politically SUBJECT group (aka modest plebeian becoming powerful people) – as to the Middle Classes in the eighteen century”. PROLETARIAT: They have been used as cannon fodders, suicidal anarchist, paid protesters, food stamps, wages of raw material and commodity producer and no industrialization with higher salaries from the abusive nouveau rich. MIDDLE CLASS: Exterminated, decimated, exiled, massive diasporas and impoverished with higher taxes, devastating business regulations. ESTABLISHMENT OF THE OBSCURANTISM: Creation of central banks and international organization to regulate governments and financial systems. Trade globalization, engineered economic booms and bust with massive wealth confiscation from the Middle Class. Obscene Money Laundry through the creation of dark money out of thin air then loaned “virtually” to governments like a line of credit but you never see the paper money deposited in your account, and finally the dark money is gradually converted into real money through interest payments received on the loans! Money creation out of money that Cicero called “It is murder” and so he was later decapitated. II THE POLITICAL-SOCIO-ECONOMIC PLAYBOOK OF THE USA ESTABLISHMENT OF THE OBSCURANTISM PLAYED TO PERFECTION BY THE BUSH AND BOURBON DEMOCRATS (19902016) 1. UNLIMITED DARK MONEY CREATION BY BILL CLINTON. The Bank Index grew from 25 to 95 i.e. a 300% increase in less than 10 years! 2. INSANE REAL ESTATE SPECULATION – Not enough properties in the market! The speculation was everywhere, not just real estate. For instance NASDAQ DotCom scam, students loans and so on. 3. GRADUAL INTEREST RATE INCREASES: Greenspan: “Market exuberance”. 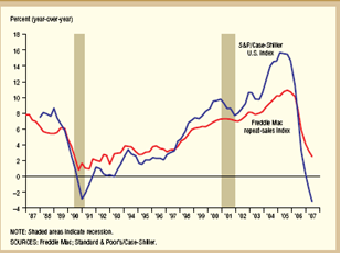 After a recession is created, the Fed start gradual decreases of the interest rate to produce the next economic boom! And so we go from boom to bust to boom to bust until the central banking scam is under government control. 4. 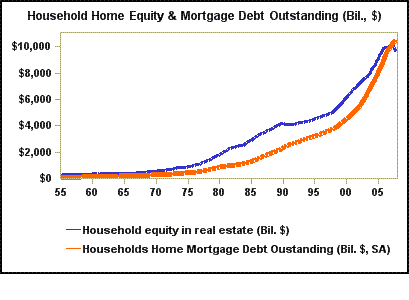 Household EQUITY GETS SMALLER than Household HOME MORTGAGE. Home equity is for most people the only investment in their life. This scam not only crashed those investments but also millions of people lost their job and the dream of their first house. 5. 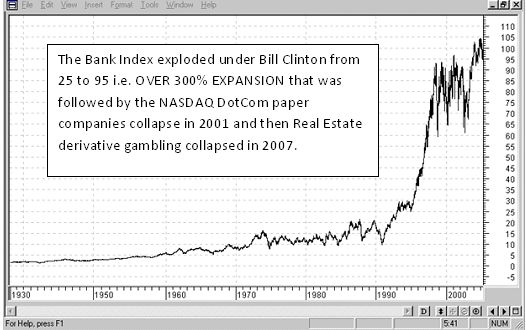 NASDAQ STOCK MARKET COLLAPSED UNDER BUSH JR. IN 2001 CREATING A RECESSION. 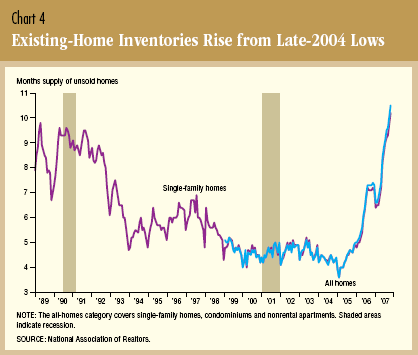 THEN IN 2008, THE REAL ESTATE MARKET COLLAPSED AND A NEW RECESSION STARTS UNDER OBAMA in 2008. 6. 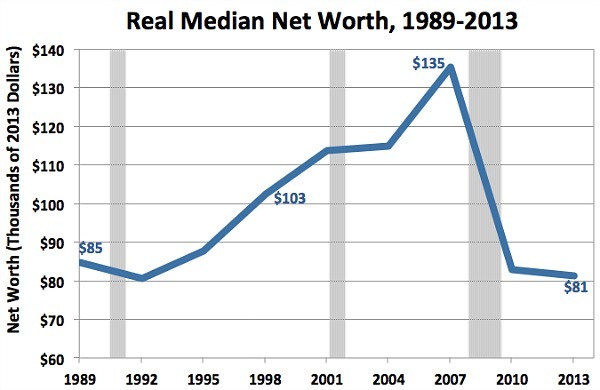 WEALTH CONFISCATION AS HOUSEHOLD NET WORTH DECREASES- Poverty strike back under Bush and under Obama thanks to Bill Clinton obscene amount of dark money created. 7. MULTI-TRILLION MONEY LAUNDRY SCAM PROCESS STARTS: The Dark Money created now becomes Public Debt that will be paid by i.e. CONFISCATED from the Middle Class and their businesses. Thus the debt is always a Dark Money scam but the payment of the public debt (also corporate and personal debt) and interest are always done with legitimate money created within the Real Economy. El Chapo Guzman was in the order of $6 billion money laundry business a year from drug trafficking; he is in jail. However, the Federal Reserve and their Primary Dealers just in the U.S.A. do over $500 BILLION A YEAR conversion of Dark Money into Real Money (still paper money but is at least regulated). 8. DARK MONEY (DEBT) IS GRADUALLY CONVERTED INTO REAL MONEY BY THE BILLIONS CONFISCATED FROM THE MIDDLE CLASS TAXPAYER. Loans they never approved nor benefit from it. This is the growing virtual enslaving of the XXI century Middle Class. Public debts will never be allowed to be paid in full. If all countries were able to pay their debt (or just default to hoax) they would have killed the chicken with the golden eggs of the establishment of the obscurantism, the gentry’s class or parasites as they were called by ancient Greeks. III. WHY PRESIDENT DONALD TRUMP ECONOMIC POLICIES ARE HATED BY THE BOURBON DEMOCRATS AND SOME REPUGNANT RATS LIKE PAUL RYAN THAT NEVER STOP THIS FINANCIAL CRIME AGAINST THE AMERICAN MIDDLE CLASS. Tax reduction to people and business. Fair Trade to reduce endemic trade deficits. Revive steel and coal mine strategic sector. Foreign capital coming back to the U.S.A.
People can see the result very fast because President Trump is transforming and improving the Real Economy bottom up NOW - not tomorrow like the “pie in the sky that never gets delivered” by left wing politicians. The Real Economy is measured in many ways. Let’s see here how the GDP is progressing steadily Quarter by Quarter. The GDP performance will improve as the trade deficit gets reduced. You may notice that China 10% growth are over because ‘trade surplus is added to the GDP”. 2. THE CRUCIAL FIGHT AGAINST THE FEDERAL RESERVE INTEREST RATE INCREASES. Their independence is a hoax! These economic policies are getting millions of people out of unemployment, out of food stamp, out of poverty, out of the ideological frame of the left and out of the marching Democrat voters. The militant Federal Reserve hates this process of a powerful and wealthy Middle Class that eventually will control the USA political power. The following chart shows how the Feds lowered the interest rate 90% (from 4.5% to 0.25%) to OBAMA for 8 years, the lowest in USA history. But now they are aggressively increasing the interest rate 1,000%, (from 0.25% to 2.5%) in less than 2 years when there is NO INFLATION and no speculation because the USA ECONOMY IS EXPANDING BASED ON SOUND ECONOMIC POLICIES! 3. 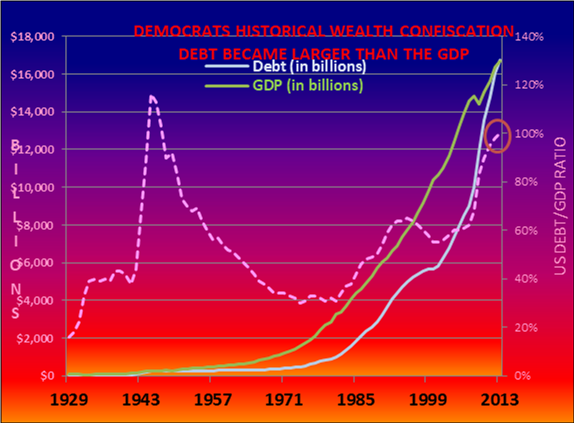 THE USA MUST FIGHT BACK THE FEDERAL RESERVE because Obama doubled the debt to bail out the insolvent financial bankers. Therefore he got the lowest interest rate in USA history at 0.25% for eight years. The economy was stagnant because almost nothing was invested in the Real Economy. However the feds today are crucifying President Trump Administration and the Middle Class with about $530 billion a year money laundry just to serve the debt at 2.5%. If the Fed keeps increasing the interest rate to about 4% IT WILL CREATE A MASSIVE RECESSION because the cost of serving the debt will be over ONE TRILLION PER YEAR! Thanks to Obama! 4. 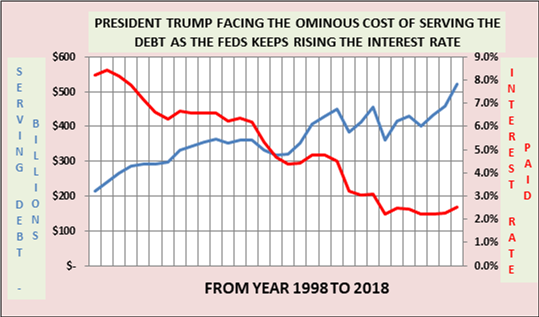 PRESIDENT TRUMP IS FACING THE OMINOUS RAISING COST OF SERVING THE DEBT AS THE FEDS ARE DETERMINED TO DESTROY THE AMERICAN MIDDLE CLASS GROWING WEALTH AND POLITICAL POWER BY INCREASING THE INTEREST RATE. THERE IS NO INFLATION JUST THE IDEOLOGICAL DETERMINATION TO DESTROY THE RULING OF THE MIDDLE CLASS IN THE MOST POWERFUL REPUBLIC ON EARTH. They are afraid of a snow ball effect that is not caused by President Trump but by the corrupted liberal and left wing governments around the world. Cheers – God bless you all. P.S. I will be publishing soon a book analyzing the genesis of the liberal and left wing ideology, its historical links to the establishment of the obscurantism and the creation and control of the central bank as a tool to confiscate the wealth of the Middle Class. Stay tuned!